Now that all murder suspects with outstanding warrants out of Clayton County have been captured, Armed Robbers have moved up the list. This move up the assembly line resulted in Denescoe Khalil Rose moving to the #1 slot on the Sheriff’s Top Ten Most Wanted for an armed robbery he committed June 28, 2018 in Jonesboro. 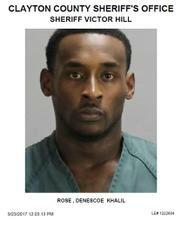 On that date, Rose forcibly took an iPhone 7 and $300 cash from the victim during a planned robbery inside a residence. Rose withdrew a black handgun with a silver slide and struck the victim in the head causing a laceration. 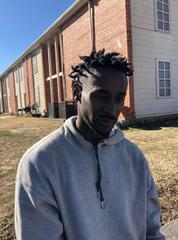 Yesterday afternoon, Denescoe Khalil Rose was taken into custody by the US Marshals Service in Tulsa, Oklahoma. Rose was discovered to be residing in his girlfriend’s apartment and was taken into custody while taking out the trash. A room at the “Hill-ton” is still reserved for Rose so that he can practice facing the wall at Georgia’s toughest para-military jail.